The archipelago of the Comoros in the Indian Ocean, composed of the islands of Mayotte, Anjouan, Moheli, and Grand Comore declared independence from France on 6 July 1975. France did not recognize the independence of Mayotte, which remains under French administration. Since independence, Comoros has endured political instability through realized and attempted coups. In 1997, the islands of Anjouan and Moheli declared independence from Comoros. In 1999, military chief Col. AZALI Assoumani seized power of the entire government in a bloodless coup; he initiated the 2000 Fomboni Accords, a power-sharing agreement in which the federal presidency rotates among the three islands, and each island maintains its local government. AZALI won the 2002 federal presidential election as president from Grand Comore island, and each island in the archipelago elected its president. AZALI stepped down in 2006 and President SAMBI was elected to office as president from Anjouan. 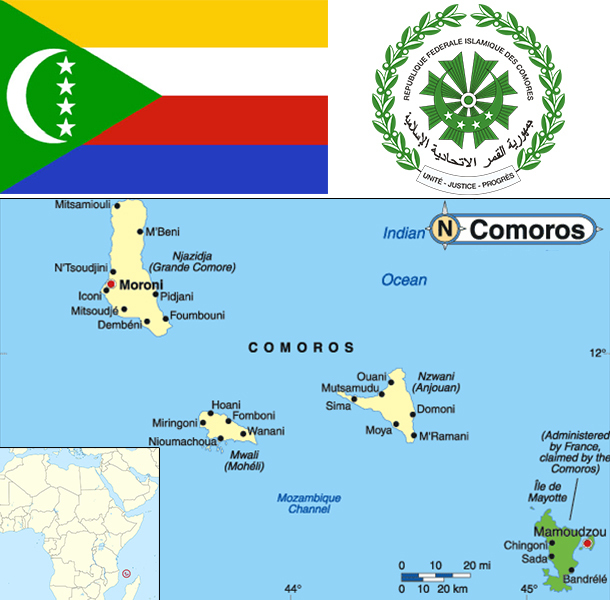 In 2007, Mohamed BACAR effected Anjouan's de-facto secession from the Union of Comoros, refusing to step down when Comoros' other islands held legitimate elections in July. The African Union (AU) initially attempted to resolve the political crisis by applying sanctions and a naval blockade to Anjouan, but in March 2008 the AU and Comoran soldiers seized the island. The island's inhabitants generally welcomed the move. In May 2011, Ikililou DHOININE won the presidency in peaceful elections widely deemed to be free and fair. One of the world's poorest countries, Comoros is made up of three islands that are hampered by inadequate transportation links, a young and rapidly increasing population, and few natural resources. The low educational level of the labor force contributes to a subsistence level of economic activity, high unemployment, and a heavy dependence on foreign grants and technical assistance. Currently, authorities are negotiating with the IMF for triennial program assistance. Agriculture, including fishing, hunting, and forestry, accounts for 50% of GDP, employs 80% of the labor force, and provides most of the exports. Export income is heavily reliant on the three main crops of vanilla, cloves, and ylang-ylang; and Comoros' export earnings are easily disrupted by disasters such as fires and extreme weather. Despite agriculture’s importance to the economy, the country imports roughly 70% of its food; rice, the main staple, accounts for the bulk of imports. The government - which is racked by internal political disputes - is struggling to provide basic services, upgrade education and technical training, privatize commercial and industrial enterprises, improve health services, diversify exports, promote tourism, and reduce the high population growth rate. Recurring political instability, sometimes initiated from outside the country, has inhibited growth. Remittances from about 200,000 Comoran diaspora contribute about 25% of the country’s GDP. In December 2012, IMF and the World Bank's International Development Association supported $176 million in debt relief for Comoros, resulting in a 59% reduction of its future external debt service over a period of 40 years. In late 2013, a US-based investment company invested $200 million in a project to explore for hydrocarbons in Comoran territorial waters, the largest financial investment in the country’s history.